Building upon the strengths of the first edition while continuing to extend the influence and reach of organizational behavior (OB), the Second Edition of this groundbreaking reference/ text analyzes OB from a business marketing perspective-offering a thorough treatment of central, soon-to-be central, contiguous, and emerging topics of OB to facilitate greater viability and demand of OB practice. New edition incorporates more comparative perspectives throughout! Written by 45 worldwide specialists and containing over 3500 references, tables, drawings, and equations, the Handbook of Organizational Behavior, Second Edition is a definitive reference for public administrators, consultants, organizational behavior specialists, behavioral psychologists, political scientists, and sociologists, as well as a necessary and worthwhile text for upper-level undergraduate and graduate students taking organizational behavior courses in the departments of public administration, psychology, management, education, and sociology. 1. 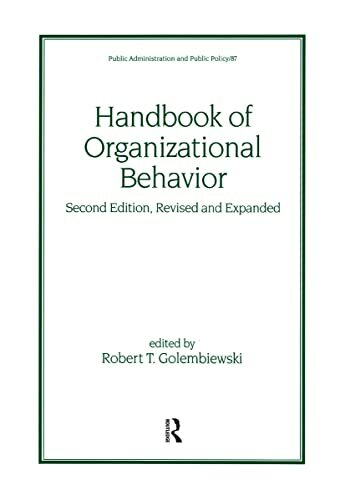 Handbook of Organizational Behavior, Second Edition, Revised and Expanded (Public Administration and Public Policy) [Hardcover] Golembiewski, Robert T.
2. Handbook of Organizational Behavior, Second Edition, Revised and Expanded (Public Administration and Public Policy) [Hardcover] Golembiewski, Robert T.